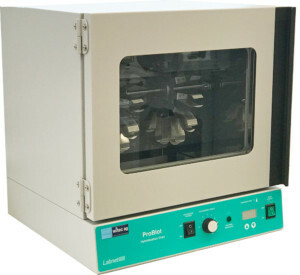 More than just a hybridization oven, the ProBlot™ 12S has a shaking mechanism built-in to the base, expanding its use to other applications. Microprocessor control and mechanical convection provide an extremely precise and uniform temperature environment. 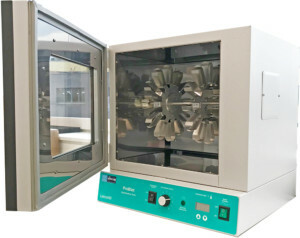 This makes the hybridization system ideal for Northern and Southern blots as well as growth of cultures and other applications requiring tightly controlled incubations. 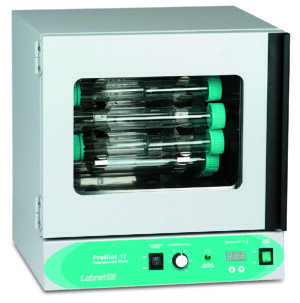 The rotisserie supplied with the ProBlot™ 12S accepts 35 mm diameter bottles as well as 50 ml tubes. Speed of the rotisserie is variable and the axis is adjustable for setting the desired level of agitation. The shaker has an orbit of 10 mm and a maximum speed of 300rpm. Operation of both the shaker and rocker are controlled by a 2 hour timer with a hold position for continuous operation. Using the nonslip rubber mat on the shaker base allows plates, dishes and boxes to be shaken. The flask platform, available separately, is supplied complete with 6 x 250 ml flask clamps. Customized platforms are available upon request. The ProBlot™ 12S is supplied with rotisserie, a flat shaker platform with rubber mat that also serves as a drip tray, 2 large bottles and one pack of hybridization mesh. Available accessories include a rocking platform and shaker flask platform.